Director: Adam Wingard / Writer: Simon Barrett / Cast: Sharni Vinson, A.J. Bowen, Joe Swanberg, Nicholas Tucci, Wendy Glenn, Barbara Crampton, Rob Moran, Sarah Myers, Amy Seimetz, Ti West, Simon Barrett, L.C. Holt, Lane Hughes. An amorous couple are totally murdered in their plush home, the words “you’re next” are painted in blood on a window for one of them to find. Soon after, cutesy couple Crispian and Erin drive out to his parents’ secluded vacation home, which is approximately the size of a small suburb, for a 35th wedding anniversary gathering. The next day, Crispian’s brothers and sister arrive with their respective partners: Dad’s favourite Drake and his tightly wound wife, Kelly; moody Felix and goth-lite girlfriend Zee; and perky Amy and her filmmaker beau whose name I don’t remember, but Ti West played him. There’s tension between Drake and Crispian, Erin tries to ingratiate herself as the outsider (in addition to it being her first time meeting them, she’s an Australian in a house full of Americans), and Mom (the always welcome Crampton) is all jittery and hears a few strange noises in the house. The group gather for dinner and in the midst of a row between brothers, are suddenly attacked from outside by a crossbow-wielding maniac with great aim. There’s panic, chaos, injury and a dead body on the floor. Next, somebody tries to make a run for the car only to career next-first into a wire, and another flees successfully through the woods to the already-dead neighbours and receives an axe in the head for her trouble. Back at the house, it becomes clear that not only is there more than one assailant, but that some of them are already inside the house. Erin takes charge after Crispian elects to make a run for help, and admits to her bewildered companions that she grew up in a survivalist camp in the Australian outback – something the killers hadn’t banked on, especially when she efficiently begins taking them out. But that’s not all, the Whys of the situation become clear as it comes out that the three amigos aren’t just randomly attacking the super-rich family, but someone has hired them to do so for their own greedy motivations. Erin learns this, discovers she’s more or less on her own from there on out, and transforms into a gung-ho heroine Sigourney Weaver would be envious of, and she’s dangerous with a blender. 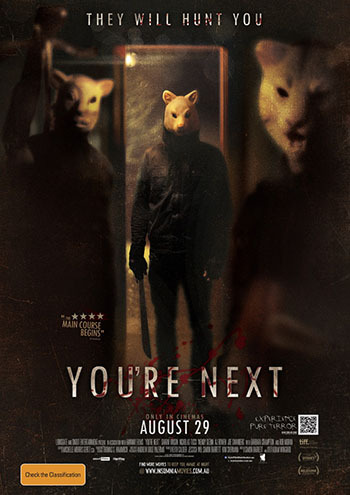 You’re Next doesn’t really pack anything that’s not been seen before in terms of other home invasion and slasher films, though it’s good to see them spliced together with an absence of gunfire for the sake of more conventional slasher movie weapons, such as axes, knives, and cleavers. The power of the film lies in Erin’s skills at defending herself and fighting back harder than these suckers thought was possible. With the right audience, You’re Next will be a great cinema experience. Fortunately, seeing it at FrightFest meant people whooped and cheered at the right moments, laughed at the (mercifully subtle and few) gags, and were on the final girl’s side early on. Whether it has enough mass-appeal is another thing; it’s not too bloody to put off casual viewers and it thankfully doesn’t feature killers who can’t be put down after numerous counter-attacks. Blurbs-of-interest: A.J. Bowen was in Hatchet II; Barbara Crampton was in Castle Freak; Ti West directed The House of the Devil, The Innkeepers, and one of the shorts in V/H/S; Adam Wingard also directed the crappy Home Sick, so it’s nice to see him leap forward here. Now THIS is a Home Invasion slasher! YOU HEAR ME JAMES DEMACO?! THIS IS HOW THE PURGE SHOULD HAVE BEEN!